Running Remote is the largest event for practical advice from leading CEO's, Founders, and Project Managers who build and manage remote teams. Some of their speakers include Buffer CEO Joel, Gascoigne, Doist CEO, Amir Salihefendi, and Github's Director of Global Workplace Operations, Lara K Owen. Topics will cover hiring practices, financial management, company culture and collaboration tools. If you’re running a remote team or serious about starting one, this is the conference for you. 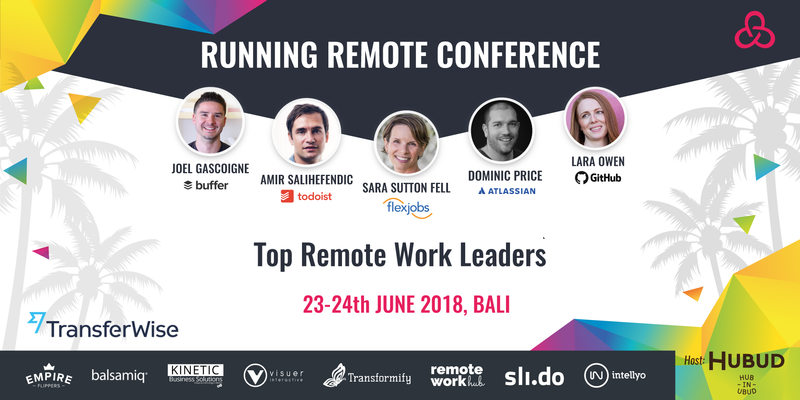 The Running Remote Conference 2018 is carefully curated to teach you next-level, actionable strategies and tactics you can utilize the very next day to manage & grow your remote team. This is the conference we’ve been trying to find but until now it didn’t exist. Learn from leaders of these companies: Buffer, Atlassian, Doist, FlexJobs, Transferwise, Dribbble, GitHub, GitLab, Time Doctor and Mailbird. The event is being sponsored by group of companies whose workforce entirely or substantially consists of remote employees. They are: Transferwise, Newswire, Visuser, Kinetic Business Solutions, Time Doctor, Hubud, Empire Flippers, Balsamiq, E-Estonia, Crunchbase, WebinarNinja, Transformify, Intellyo, Remote Work Hub, Coworkation & Slido. Sign up for email updates from RunningRemote Conference 2019.